THE END OF THE CIVIL WAR in the spring of 1865 began a national discussion that has not stopped 125 years later. What did the war mean? What was its significance to the nation? More momentously, what was its significance to God? "I charge the whole guilt of this war upon the ambitious, educated, plotting leaders of the South.... A day will come when God will reveal judgment and arraign these mighty miscreants.... And then these guiltiest and most remorseless traitors ... shall be whirled aloft and plunged downward forever and ever in an endless retribution." In the South, Robert Lewis Dabney (1820-1898) was almost as prominent as Beecher in the North. A Presbyterian defender of Scripture and of traditional confessions, he was even more orthodox than Beecher. During the war Dabney served on the staff of General Stonewall Jackson; afterward he presided over seminaries in South Carolina and Texas. Yet from wherever Dabney viewed the conflict, his opinion was the same. The war, he thought, was “caused deliberately” by evil abolitionists who persecuted the South “with calculated malice.” When fellow Southerners asked him to soften his views on denominational colleagues in the North, Dabney had only these chilling words: “What! Forgive those people who have invaded our country, burned our cities, destroyed our homes, slain our young men, and spread desolation and ruin over our land?! No, I do not forgive them." In contrast to Beecher and Dabney—and the assumption that only one side enjoyed the blessing of God —stands the odd figure of Abraham Lincoln. At least, he held an odd view in those heated days of sectional strife. Ministers and theologians, who day and night studied the Scriptures, knew very well where God stood on the war (though, of course, they differed among themselves). We would expect Lincoln, as the Union’s president, to be just as partisan as Beecher. We would assume Lincoln to be just as vituperative about Southern leaders as Dabney was about the North’s. Yet Lincoln, though he pondered the ways of God almost as steadily as the professionals of religion, was not so sure. Admittedly, in his first inaugural address, in March 1861, Lincoln had presented a fairly conventional view of God and the American nation. The “ultimate justice of the people,” he said, would prevail, for there was no “better, or equal, hope in the world.” Lincoln saw a solution to the national crisis in terms of civil religion: “Intelligence, patriotism, Christianity, and a firm reliance on Him, who has never yet forsaken this favored land, are still competent to adjust, in the best way, all our present difficulty.” God, in other words, would stick with the Americans, whose own virtues would lead them out of trouble. Soon, however, the vicious realities of war began to stir something else in the Northern president. As early as 1862 Lincoln began to think the unthinkable: Perhaps the will of God could not simply be identified with American ideals and the effort to preserve the Union. "The will of God prevails. In great contests each party claims to act in accordance with the will of God. Both may be, and one must be, wrong. God can not be for and against the same thing at the same time. In the present civil war it is quite possible that God’s purpose is something different from the purpose of either party—and yet the human instrumentalities, working just as they do, are of the best adaptation to effect His purpose. I am almost ready to say this is probably true—that God wills this contest, and wills that it shall not end yet. By his mere quiet power, on the minds of the now contestants, He could have either saved or destroyed the Union without a human contest. Yet the contest began. And having begun He could give the final victory to either side any day. Yet the contest proceeds." Like a figure from Israel’s ancient history, Lincoln was arguing with God. But it was no longer a domesticated deity, an American God, but the ruler of the nations. The truth had begun to dawn to Lincoln that this God was not at the nation’s beck and call, but the nation at his. His thinking was beginning to diverge from the paths followed by Beecher, Dabney, and the overwhelming majority of his contemporaries. "Neither [side] anticipated that the cause of the conflict [i.e., slavery] might cease with, or even before, the conflict itself should cease. Each looked for an easier triumph, and a result less fundamental and astounding. Both read the same Bible, and pray to the same God; and each invokes His aid against the other. It may seem strange that any men should dare to ask a just God’s assistance in wringing their bread from the sweat of other men’s faces; but let us judge not that we be not judged. The prayers of both could not be answered; that of neither has been answered fully. The Almighty has His own purposes. ‘ Woe unto the world because of offences! for it must needs be that offences come; but woe to that man by whom the offence cometh! If we shall suppose that American Slavery is one of those offences which, in the providence of God, must needs come, but which, having continued through His appointed time, He now wills to remove, and that He gives to both North and South this terrible war as the woe due to those by whom the offence came, shall we discern therein any departure from those divine attributes which the believers in a Living God always ascribe to Him? Fondly do we hope —fervently do we pray—that this mighty scourge of war may speedily pass away. Yet, if God wills that it continue, until all the wealth piled by the bondman’s two hundred and fifty years of unrequited toil shall be sunk, and until every drop of blood drawn with the lash, shall be paid by another drawn with the sword, as was said three thousand years ago, so still it must be said, the judgments of the Lord are true and righteous altogether." How could Lincoln point to the commanding sovereignty of a great God, while professional clerics spoke almost exclusively of a “house god” completely in league with the North or the South? How could such a profound grasp of God’s grandeur come from an ordinary lawyer and politician, who during his lifetime was scorned for lack of culture? There can be no final answers to these questions. But a brief look at the debate over Lincoln’s religion, and at the circumstances of his life, can at least provide hints. Confusion about Lincoln’s religion arises from the multiple ambiguities of his life. On the one hand, Lincoln was, in the words of biographers James Randall and Richard Current, “a man of more intense religiosity than any other President the United States has ever had.” On the other hand, Lincoln’s faith was not conventional. As a young man in Illinois, he eagerly read free thinkers like Tom Paine. At the same time, he was a kind of “frontier spiritualist” who believed that signs, dreams, and portents foretold the future. He had no use for Christian creeds or statements of faith, and little use for formal theology. At least early on, Lincoln was probably also a Universalist who believed in the eventual salvation of all people. He spoke of God often and in many different ways—William J. Wolf counted thirty-three different expressions, like “Almighty Being” or “Father of Mercies,” in Lincoln’s Collected Works. Yet Lincoln rarely referred to Jesus. After the death of his 4-year-old son, Edward, in 1850, he regularly attended Presbyterian churches in Springfield and Washington, pastored by doctrinal conservatives. Yet he never became a member of any congregation. An incident early in his political career highlights the unconventional character of Lincoln’s faith. In 1846 he stood for election to Congress from Illinois’s Seventh Congressional District. The rumor began to spread that Lincoln mocked Christianity and scoffed at religious practice. This amounted to a vital issue since Lincoln’s opponent was a Methodist circuit-riding preacher, Peter Cartwright. "That I am not a member of any Christian Church, is true; but I have never denied the truth of the Scriptures; and I have never spoken with intentional disrespect of religion in general, or of any denomination of Christians in particular.... I do not think I could, myself, be brought to support a man for office whom I knew to be an open enemy of, and scoffer at, religion. Leaving the higher matter of eternal consequences between him and his Maker, I still do not think any man has the right thus to insult the feelings, and injure the morals, of the community in which he may live...."
Even as Lincoln recognized the importance of religious propriety for public officials, he made clear that his religion was his own business. Lincoln’s manifest trust in God alongside his unconventional piety confounded his contemporaries. A popular early biography by Joseph Gilbert Holland, published in 1866, described Lincoln as a model evangelical gentleman. This greatly upset Lincoln’s law partner in Springfield, Illinois, William Herndon, who thought he knew what Lincoln was really like. The portrait in Herndon’s biography was much saltier. Lincoln was depicted as a prairie “infidel” who got along very well without the church; an ambitious, even scheming, politician; a man more fond of the bawdy than the Bible, more given to introspective melancholy than to Christian holiness. Modern studies continue the contrast. In G. Frederick Owen’s Abraham Lincoln: The Man and His Faith (published in 1976 and reprinted several times), Lincoln appears as a Christian prophet who sustained evangelical convictions throughout his life. By contrast, in Gore Vidal’s historical novel Lincoln (1984), Christianity is a superfluous veneer that Lincoln occasionally parades for political purposes. The greatest difficulty in coming to a clearer picture of Lincoln’s faith is the fact that his religion does not fit into modern categories. He was not an orthodox, evangelical, “born-again” Christian striving toward the “higher life” (as these terms have been used since the 1870s). But neither was he a skeptical “modernist” with a prejudice against the supernatural and an aversion to the Bible. Consequently, many conflicting stories about Lincoln lack concrete historical verification. In one, for example, Lincoln made a definite profession of faith; in another he was voicing agnostic opinions to the end of his days in the White House. But three historical circumstances help explain the nature of Lincoln’s religion—with its unusual belief in God’s sovereign power—that came to fullest expression in the Second Inaugural Address. First, Lincoln grew up in a poor dirt-farming family in the upper South and lower Midwest without privilege, position, or much formal education. The world of his upbringing was much closer to the culture of Puritanism than the culture of narcissism. Common people were often deeply religious, believing without question in God and the unseen world. Yet they were not much troubled about doctrines, ecclesiastical affairs, or the glorious prospect of the millennium, which then preoccupied some of America’s religious elite. Rather, the common people tried to accept their fate, to overcome guilt, to enjoy the fleeting comforts of love and family, to survive the uncertainties of birth, to eke out existence on an often brutal frontier, and to come to terms with the ever-present reality of death. As with many other such families, Lincoln’s had very few books. But it did have the Bible, which Lincoln evidently read with great care. His later speeches and ordinary conversation were peppered with biblical quotations and allusions. This family history provided the backdrop of Lincoln’s religion. It had nothing to do with modern ideas about “finding oneself” or about “God’s wonderful plan” for life. The second circumstance was Lincoln’s experience with denominations in the Indiana and Illinois of his youth. He found the harsh infighting among Methodists, Baptists, Presbyterians, Disciples, Universalists, and “village atheists” repulsive. As a consequence, Lincoln several times professed willingness to join a church that required nothing of its members but heartfelt love to God and to one’s neighbors. The competing creeds of the churches were not for him. The third circumstance was instruction in reality by the coldest master—death. The passing of his mother when he was 9, the death of a beloved sister shortly after her marriage, the death of two sons (in 1850, and at the White House in 1862), the death of several close friends in the early days of the Civil War (his Civil War), and increasingly, the heart-wrenching lists of casualties from the battlefields —these left him no taste for easy believism, no escape from the mysteries of God and the universe. The truly remarkable thing about Lincoln’s religion was how these circumstances drove him to deeper contemplation of God and the divine will. The external Lincoln, casual about religious observance, hid a man of profound morality, an almost unbearable God-consciousness, and a deep belief in the freedom of God to transcend the limited vision of humanity. Such religious qualities are unusual in any age. They were even more rare in the period of the Civil War when, for almost every one else, partisan passion transformed God from the Lord of nations into the servant of North or South. Dr. Mark A. Noll is McManis Professor of Christian Thought at Wheaton (Illinois) College and a member of the editorial advisory board of Christian History. 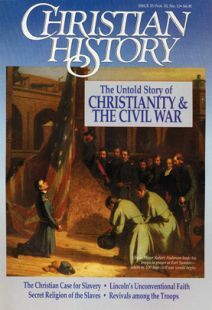 His most recent book is A History of Christianity in the United States and Canada (Eerdmans, 1992).